We had an amazing time chatting with Sola-based artist Ashley Kerkes and getting to know this vintage-loving hair stylist! This matte lipstick-wearing #GlossBoss tells us about her art and how SolaGenius helped her earn $4000 in bookings after a text campaign. Keep reading to learn how and check out the pics of her gorgeous studio at Sola Salon Studios! Specialty: Color: balayage, color melt, foliage; basically any sort of lived-in color. Secret Weapon: Kadus’ colors and products. I know it sounds cheesy since I’m on the designing team for Kadus, but I like their colors and products because I really get to take my time with my client and make their hair the way I want to be. Beauty Obsession: I’m absolutely obsessed with matte all-day lipstick! I’m a lipstick tattoo junkie -- I like when a lipstick that lasts me all day. Inspiration: I gather a lot of inspo from stuff my clients bring in...Instagram videos allow me to see other peoples’ techniques. I like to see what other people are doing and then take their techniques and making them my own. Two in particular are @beseene and @lisalovesfoliage (she does classes and everything)! Challenges with color melts: Getting a good blend and not seeing the lines. A lot of it is really just taking a step back and formulating what you need to do in order to get the color right, instead of simply picturing what you want your end result to be and trying to get there. It’s color theory, not color facts. Most fun color combo: I just did one for behindthechair on Facebook live! It was a blonde with pink roots and pieces of yellow throughout. It was a super fun color because it’s very summery. A lot of blondes don't want to see yellow in their hair, so doing that was amazing because it took something ordinary and made it extraordinary! 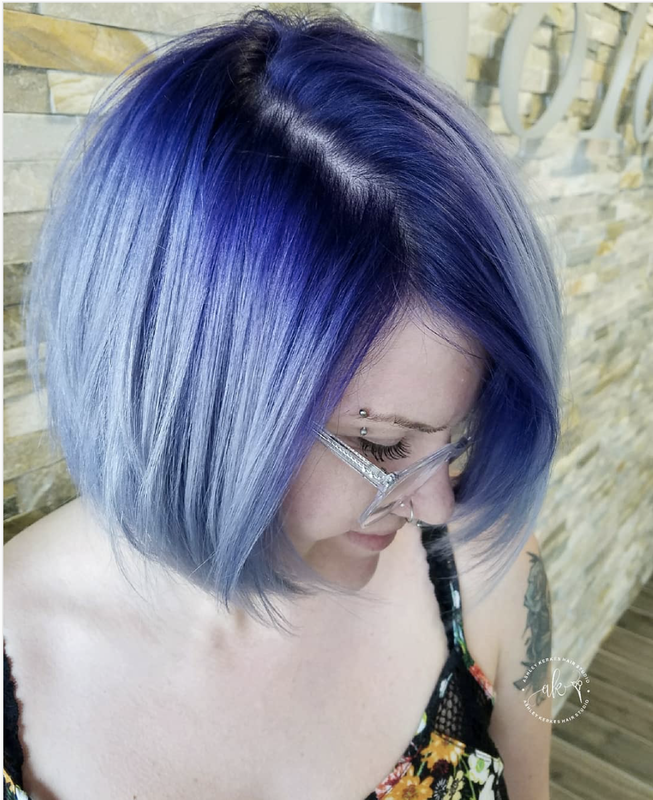 I love doing color that adds a really dramatic root on a blonde. Why I am a #GlossBoss: I’m a #GlossBoss because SolaGenius takes me from being just a hairstylist to also being a business person. It takes me from just being behind the chair to really growing my business and growing my brand. SolaGenius’s impact on her brand: I had this set up beginning of May and then switched to active on June. I’d only been using it for 15 days when I got the notification that I received $4000 in bookings after sending out a text campaign! SolaGenius is super easy to use -- I’m a good stylist, but I’m very bad at being a receptionist/salesperson. It allows me to keep track of my clients and my inventory. I love that I can take a picture of a credit card and put it on file. My most favorite part of SolaGenius is how it asks my clients if they want to book a future appointment -- 10 people have already set up recurring appointments! It helps me be a better business person all together. Before SolaGenius, I knew I needed to be doing business things, but now I’m actually doing it. Off-duty: I hang out with my kids who are are 12, 8 and 1.5. My 1.5-year-old is the sweetest little pie ever, but she is also very stubborn. I also love shopping for anything that has to do with vintage hair stuff, for example, I have 3 vintage hair dryers. I use some of the stuff I find to decorate my studio! Thanks so much for chatting with us, Ashley! Congratulations on the success you had with your GlossUp campaign and thanks for being a #GlossBoss!